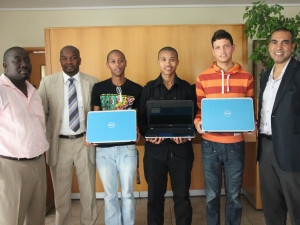 Dell bursary handover at the University of the Western cape. Dell South Africa aims to develop literate and connected communities and to bridge the gap between the "haves" and "haves-not". Providing quality education is one way in which it strives to bridge this gap. A percentage of every rand spent by a Dell customer goes to the Dell Development Fund (DDF). Over the past few years, the DDF has engaged in bursary programmes with the University of the Western Cape (UWC), the University of Venda, and the Nelson Mandela Metropolitan University (NMMU). This year, again, the DDF will be providing more academically deserving students the opportunity to have a tertiary education at these universities. According to Natasha Reuben, Head of Transformation, Dell South Africa Development Fund: "Graduating students are also offered a one-year internship position with us at Dell. As a team, we pride ourselves on focusing on real transformation within the communities we call home and are proud to be involved with these organisations. We will continue to work to ensure these initiatives deliver real value and real benefits, contributing to sustainable development and economic transformation in South Africa. "In addition to providing their tuition fees, DDF supplies the students with a Dell laptop, campus residential fees, a monthly stipend and educational materials. We strive to cater for any need they will have during the course of their tertiary education, so that they can concentrate their energies at excelling academically," adds Reuben. On completion of their final year, the students are rewarded with a Dell-sponsored and hosted year-end function, where they have the opportunity to meet and network with Dell employees. This opportunity is created for the students in order for them to meet the Dell staff and celebrate their achievements. Over the past nine years, the DDF, which has established a number of training programmes and initiatives directed towards equipping young adults with both life and educational skills, has again awarded bursaries to academically deserving students. Dell (NASDAQ: DELL) listens to its customers and uses that insight to make technology simpler and to create innovative solutions that deliver reliable, long-term value. Learn more at www.dell.co.za. The Dell South Africa Development Fund was founded based on Dell South Africa's belief that, by improving social conditions, it can improve business conditions. The Fund uses technology to provide training and develop human resources and thereby strives to bridge the digital divide. Education, enterprise development and health, in particular HIV/Aids, are the main focus areas of the Dell Development Fund. For more information, visit http://www.delldevelopmentfund.co.za.